People sometimes confuse BrooklineCAN's Livable Community Advocacy Committee with the town's Age-Friendly Cities program. The Age-Friendly Cities program is an initiative of the World Health Organization and the Town of Brookline. In the fall of 2012, after a six month planning process, Brookline submitted its application to join the network. 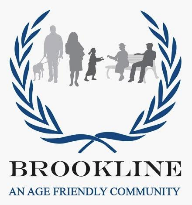 The program disseminates information about Brookline’s strong existing age friendly features and develops more specific initiatives in the following areas: health and human services, housing, library, public safety, parks, recreation, property tax relief for seniors, transportation, and participation. It is a collaboration among the Town of Brookline, the Brookline Council on Aging, and BrooklineCAN that is coordinated by a committee appointed by the Board of Selectmen. More than ten Town departments and boards and commissions are involved. The Livable Community Advocacy Committee is one of several BrooklineCAN committees. It works to influence policy on issues of interest to seniors and others. Some members of BrooklineCAN's Livable Community Advocacy Committee also serve on the town's Age-Friendly Cities committee. More information on the town's program is available here and here. The Livable Community Advocacy Committee's activities are described on the rest of this page. Brookline is already a highly attractive community for older people. The town's housing, services, transportations options, and parks make it an excellent place to live for people of all ages. The Livable Community Advocacy Committee calls attention to Brookline's outstanding qualities and advocates for changes that will make Brookline a better community. The committee collaborates with other organizations as they seek community improvements. The committee holds open meetings on a regular basis and invites all community residents to attend meetings and join the committee. Meeting minutes are here. Brookline Town Hall - Frank Caro proposes a Pedestrian Advisory Board to work with the Bicycle Advisory Board to improve the streets of Brookline for all..
Models for Senior Housing Development. Summary. Details and video.. The livable community theme has attracted a good deal of attention nationally among advocates for older people. A particularly valuable resource is the Livable Community evaluation guide developed by AARP's Public Policy Institute: (Click to download PDF.) Another resource for the committee is Partners for Livable Communities, a national nonprofit organization. On February 5, 2018, Frank Caro presented the state of financial insecurity among Brookline seniors to the members of BrooklineCAN's Livable Community Advocacy Committee. Here are his slides and a handout. In the summer of 2016 Brookline’s Park and Open Space Division completed work on a pedestrian oasis at the corner of Green Street and John Street near Coolidge Corner. Several years ago, the area was little more than an extension of a Town parking lot with a few neglected benches, overgrown vegetation, and numerous cigarette butts. The “seating area” has been transformed into a mini park with 10 cherry trees and an abundance of azaleas and rhododendrons. Generous donations by Brookline residents have provided handsome and comfortable benches. BrooklineCAN promoted the project and participated in the design process. At one of its first meetings, our Livable Community Advocacy Committee asked Park and Open Space Director Erin Gallentine to upgrade the property. At the time, it was not even on the Town’s open space inventory. Erin committed to an upgrade with the intention that the space be particularly senior friendly. 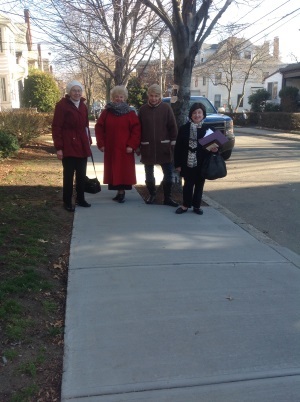 Thanks to an innovative project initiated by BrooklineCAN and involving several Brookline organizations, senior housing residents learned how to organize and present their sidewalk concerns to the Brookline Housing Authority (BHA) and the Department of Public Works (DPW). To everyone's delight, the DPW committed to and repaired most of the sidewalks identified by the residents. Click here for Brookline Tab article. 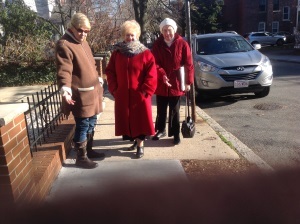 (from L to R) Joan McCabe, BrooklineCAN volunteer; Titiana Rapoport and Mila Rudyakov, O’Shea House residents; and Susan Granoff, BrooklineCAN volunteer, are pleased with the condition of the Auburn Street sidewalks repaired in fall of 2016 by Brookline DPW. O'Shea House resident Steve Drenga documents rough Auburn Street sidewalk. O’Shea House residents Mila Rudyakov and Tatiana Rapoport and BrooklineCAN volunteer Joan McCabe admire repaired and smooth Auburn Street sidewalk. The guide was prepared by BrooklineCAN’s Livable Community Advocacy Committee. In part, the committee calls attention to features that make Brookline a highly livable community. On this page you can find a map of commercial building with doors that open automatically. The committee surveyed and tried out each of the doors identified on the map. Since condition and performance of doors change over time, please inform BrooklineCAN of any changes in the status of any of the doors. Visitors to the Senior Center often stay more than two hours. Those who drive find that the town's two-hour parking limit is a major inconvenience. This causes some to stay away. The Senior Center and BrooklineCAN's Livable Community Advocacy Committee are working with the town to offer an exception to the two-hour limit for Senior Center visitors. Read all about it here. BrooklineCAN co-sponsored an educational forum on Complete Streets on June 12, 2014 at the Main Library. Complete Streets is a national movement that urges municipalities to develop transportation plans that balance the needs of pedestrians, bicyclists, public transportation users, and motorists. A panel of experts illustrated how Complete Streets design concepts can make the street scape more livable for people of all ages. 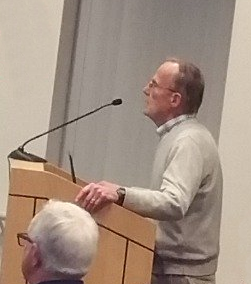 Scott Englander of the Brookline Transportation Board served as moderator. BrooklineCAN’s leadership role grew out of its advocacy for pedestrians. BrooklineCAN worked with the Brookline Green Caucus (Town Meeting members with strong environmental concerns) in planning the forum. Click here for information about the panelists and other sponsors. As part of Brookline's Age-Friendly Cities initiative*, the Board of Selectmen, Housing Advisory Board, Economic Development Advisory Board, Council on Aging, Health Department and Brookline Community Aging Network (BrooklineCAN) convened a panel of experts who are familiar with Brookline to discuss a variety of models of senior housing. On Sunday April 7, 2013 the panelists considered models of housing and services for older people whose needs and financial resources differ widely, in hopes of stimulating discussion, interest and, ultimately, action. This forum attracted both to policy makers and those considering their own futures in Brookline. Because of our concerns for pedestrian safety, we are examining the regulation bicycle riding on sidewalks in Brookline. In taking up this issue, we are responding particularly to concerns of Beacon Street residents. Beacon Street is used extensively by bicycle commuters. Some cyclists have taken to the sidewalks because they consider the street to be unsafe. Sidewalks are not wide enough for both cyclists and pedestrians. State law prohibits riding of bicycles on sidewalks in commercial areas. Unfortunately, the boundaries of commercial areas in Brookline are ambiguous as they apply to riding of bicycles on sidewalks. For that reason, it is not clear where state law prohibits riding of bicycles on Beacon Street. To the extent that they are involved with enforcement of traffic regulations involving cyclists, Brookline police discourage riding of bicycles by adults on sidewalks throughout the Town. However, the legal basis for police policy is uncertain. Cyclists have reason to be uncertain about Town policies concerning bicycles on sidewalks. The Town wants to promote safety for both cyclists and pedestrians but has not carefully examined how they should share the sidewalks. As a result of our inquiries, the Town's legal department has asked the Transportation Board to develop new regulations concerning operation of bicycles on sidewalks. The Board has agreed to take up the issue. We are working with the Board to formulate an effective remedy. Reflecting our concerns about pedestrian safety, we are monitoring sidewalk conditions in commercial areas after snow storms. In past years, Brookline sidewalks have often been hazardous after storms because of snow and ice. We are particularly concerned about commercial areas because they are used extensively by pedestrians. Owners of commercial properties and apartment buildings are responsible for clearing sidewalks of snow and ice within a few hours after winter storms. Although the Town helps by plowing many sidewalks including those in commercial areas, property owners remain responsible. Enforcement duties are shared by the Police department, Health Department, and Department of Public Works. Nevertheless, the Town relies heavily on residents to file complaints when there are problems. We have set up a team that is inspecting sidewalk conditions in the major commercial areas after each significant snow storm. We are reporting problems through Brookonline. The Department of Public Works is committed to following through on our reports. We currently have the capacity to cover Brookline Village, Coolidge Corner, and Washington Square. We welcome other volunteers who will extend our capability at least to the other commercial areas. By calling attention to the importance of safe sidewalks throughout the winter, we hope to achieve more effective public and private efforts to clear sidewalks of snow and ice. Article 28: Enforcement of town’s by-law on clearing snow and maintaining sidewalks in business districts. Vote: Favorable action. Town Meeting went against the wishes of the Board of Selectmen and Advisory Committee, who both suggested the issue be referred to the town administrator. Instead, the article passed cleanly, which means the town will be tasked with proactively sending out enforcement officials on the fourth daylight hour after snowfalls to issue warnings and tickets instead of waiting for complaints to be submitted. Editorial: This is an example of why everyone should support BrooklineCAN. To exclude from the computation of the whole estate that real property occupied as his/her/their domicile except for any portion of said property which produces income and exceeds three dwelling units. In May 2011, Town Meeting approved this proposed relaxation in eligibility criteria for the senior property tax exemption. Committee members are examining Brookline parks with an eye on features that make them attractive to older residents. The committee is particularly interested in parks in neighborhoods with large concentrations of older residents. Paths and benches are of particular concern. The committee wants to be assured that paths are in good condition and are free of high-speed bicycle traffic. The committee also wants all parks to provide benches and that benches be in good condition. 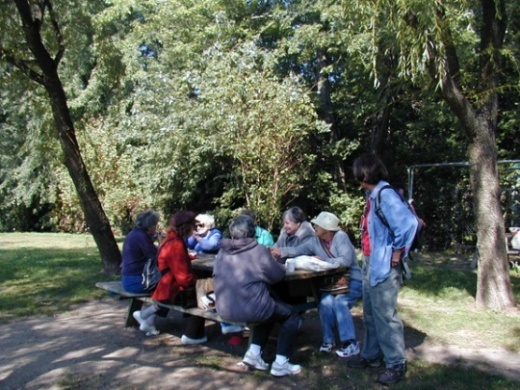 Serving Seniors in Brookline Parks, an article on this subject by Livable Community Advocacy Committee chairman Frank Caro, appears in the Brookline Greenspace Alliance's fall 2015 newsletter. Walking is important for older residents both as a transportation option and as a form of exercise. 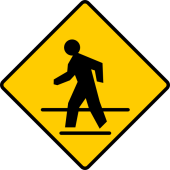 Good sidewalks are essential for safe walking. Brookline has a major effort to improve sidewalks in progress. Yet, sidewalk conditions need attention not only in the winter but throughout the year. The committee will call attention to sidewalks that particularly need attention. Cross walks are also important for pedestrian safety. The committee will advocate for well-marked cross walks and enforcements of laws to protect pedestrians. Recently, the Livable Community Advocacy Committee reported a neglected crosswalk on Station Street near the Brookline Village T stop. Within two weeks the crosswalk was repainted. A recent increase in the town's street painting budget allows the Department of Public Works to repaint lane markings twice a year. 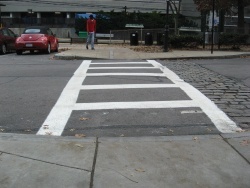 If you spot a crosswalk that needs repainting, call them at 617-730-2156. People of all ages may have an immediate need for access to a toilet when away from home. Visitors to the town’s commercial areas may not readily find a toilet that is open to the public. The committee will encourage merchants to make toilets available to the public. 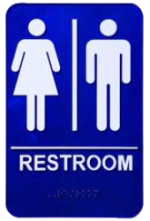 Thus far, the committee has identified restrooms in Brookline's public buildings. We are also identifying restrooms available to the public in the town's commercial areas. The committee recognizes that housing is a major concern of older residents and will support efforts to expand options for those with low and moderate incomes. To make improved information available, we have produced a guide to apartment buildings and condominiums throughout Brookline. Only larger buildings with elevators are included. These guides are for BrooklineCAN members only. We are concerned about the consequences for low-income, older Brookline home owners of a new method of determining charges for use of water. In July 2011, the Town adopted a new method of calculating charges for use of the water it purchases from the Metropolitan Water Resources Authority and distributes through the Town’s pipes. The old payment system charged customers entirely on the basis of the extent of their water use. The new system introduces a base charge for all users regardless of the amount of water they use. The base charge for most residential customers in the new system is $200 per year. In addition, the new system continues to charge customers on the basis of the amount of water they use. The rationale for the base charge in the new system is that the Town has fixed costs for supplying water regardless of the amount of water used. One consequence of the new payment system is a proportionately large increase in charges for those who use very little water. We are concerned about low-income older home owners who use minimal amounts of water who may have difficulty in adjusting their budgets to absorb a steep increase in the cost of water. The Town is sensitive to the plight of cash-poor older homeowners and offers several programs to reduce or defer property taxes. We want the Town to be similarly sensitive to low-income older residents in its charges for other services. With help from the Assessor’s office, we have learned that approximately 100 households headed by an older person are participating in a program to reduce or defer property taxes. Of these, 13 are single-family households. The Town has agreed to examine changes in use of water and charges for water over time to determine how these households have actually been affected by the change in the payment system. We have been assured that the Board of Selectmen shares our concern about the possible adverse impact of “rate shock” on low-income households. The Board will consider a means-tested reduction in base rates if there is evidence of an adverse impact of the system on low-income households. 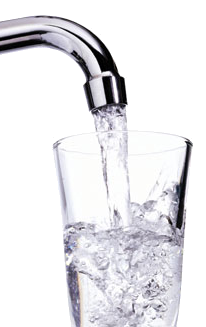 The Town is monitoring water use and water charges for the final six months of 2011. We expect that data will be available in January. We will be examining the results of the analysis as soon as the information is available. We are prepared to advocate for revised rates in the fiscal year that begins in July 2012. The Board of Selectmen is responsible for setting rates for water use as it is for use of other Town services. In this instance, we are concentrating on home owners because they are charged individually for water use. In the case of multi-family residences, a single water pipe usually serves an entire building. Each building has its own method of charging residents for water. When low-income families live in multi-family buildings with a single water service, there usually is also no way to measure use of water by residents of a particular unit. For these reasons, it is not feasible to determine the extent to which there are frugal, low-income water users who live in multi-family buildings who are adversely affected by the new billing system. The possibility of having to stand in line in inclement weather waiting to use the pay station. 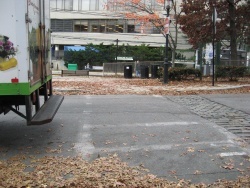 While these factors represent inconveniences for most of us, they pose real hazards for elderly people who, while still able to drive and do business around Brookline, may be frail, more prone to losing their balance, or have difficulty walking longer distances. 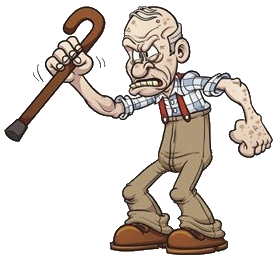 We would like to help develop a special program for senior residents that would enable them to purchase an annual parking permit instead of paying for each use. Such a program would be revenue-neutral and enable elderly residents to continue enjoying Brookline’s commercial areas. Many communities and municipalities do have special programs for older drivers. 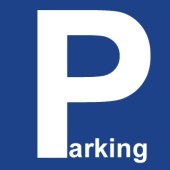 In Newton, for example, for $6 per year and in Natick at no charge, senior residents can obtain special parking permits that allow them to park without feeding the meter. We are currently working with Mel Kleckner, Brookline Town Administrator, to further research this idea and assess its practicality for Brookline. Here is an article that talks about BrooklineCAN's work in this area. Permits may be obtained for up to 180 days; when necessary, permits may be extended for another 180 days. Caregivers may park on Brookline streets except when there is a town parking lot within 500 feet of the residence of the care recipient. In those cases, caregivers are expected to park in Town lots. Caregivers are not required to pay a fee for permits. Caregivers of all kinds are eligible for permits: employees of home care agencies, those employed directly by care recipients, volunteers, family members, and friends. Each caregiver must obtain a permit. Caregivers must provide documentation of need from a home care agency, a doctor, or a Council on Aging social worker. Permits may be obtained from the Transportation Department in Town Hall. For information, call at 617-730-2177.